4 Pics 1 Word cartoon of girl running on the street. Oriental girl with a piece of watermelon. Doing braid to blonde girl. Thanks for visiting 4-Pics-1-Word.com, here are the cheats for your favorite game. 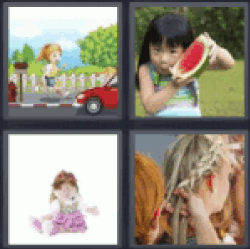 4 pics 1 word cartoon of girl running on the street. Oriental girl with a piece of watermelon. Doing braid to blonde girl.